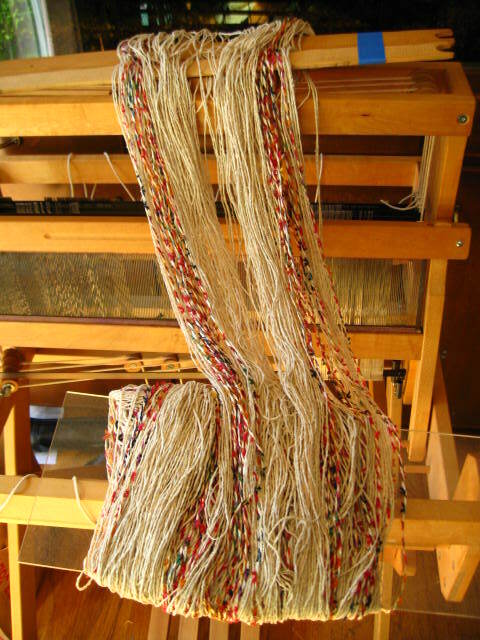 I decided to put a fourteen-inch wide, ten-foot long warp onto Gil, my Rasmussen loom. It will be a sampler of some basic twills, and used as a runner for the top of my piano. The warp is some bumpy Portugese cotton from a massive cone, and one of two small coils of viscose/nylon/cotton yarn (thirteen dollars each, and inherited from Roxy). 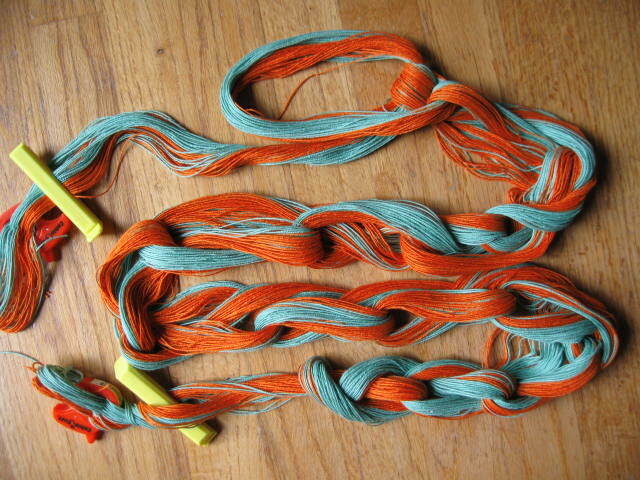 I’ll use more of the cotton and the last ball of novelty yarn for the weft. Available open space in my house is in constant flux. Since Gil is now situated in the spot I would have preferred to assemble my Bergman warping reel, I had to warp in the Kitchen. It was a tight fit, and I was backed against the sink the entire time. I’m getting used to the weighted swing of the reel: using it to my advantage, it makes warping very, very fast. I used practically no effort, only having to slow the reel to wind on a cross, then let it fall back the other direction. I wound on 196 (10-foot) ends in less than half an hour. It will be even faster in the future, since it was a bit ackward having so little room in the kitchen. I decided to warp back to front. I enlisted the help of my DH to hold and tension the warp while I wound the warp onto the back beam. Since I was working with both unskilled and grudging help, it was not a happy experience. I would need to find a way to warp on my own to preserve our marital bliss. It was only after the warp was wound on that I thought to measure the width of the warp on the back beam. My supposedly fourteen-inch warp measured only an average of twelve inches. A lightbulb came on. Is this what a raddle is used for? I immediately posted for help on Ravelry. While it was created for the knitting community, there are enough weavers (and spinners) on it that I can usually get my questions (newbie ones) answered within an hour, if not minutes. But I was too impatient to wait for an answer. When the Weaving Works told me they didn’t have any raddles in stock, I hied myself away to the closest hardware store, and came home with a pound of cable tacks. I chose cable tacks because in one of Peggy Osterkamp’s books, she recommended using screws with eye-holes. The holes are for inserting a dowel to keep the threads down. I just couldn’t see myself twisting in close to 150 screws, so I went for the cable tacks. I also didn’t want to use finishing nails because I was worried that having them sticking out might be dangerous to my very active son. I kicked myself for resisting any notion of a raddle previously. I have had severe wrist pain in the past, and I guess I was afraid I would be pounding nails for hours without end until my hand fell off. In reality, the raddle took less than an hour to finish, taking even that long because I had to stop several times to rustle up other pieces of wood for my son to hammer and to persuade him his wood pieces were much, much better to pound than mine. The raddle was made, and the warp was re-beamed within the hour following. What a difference it made! I was able to beam on by myself! 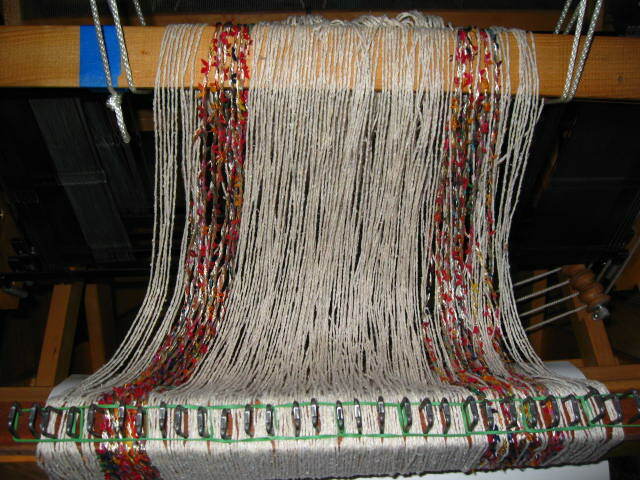 My previous experiences with warping involved more praying than skill to get the warp on the loom; this was the first time that I actually felt in control of beaming on properly — in a scientific manner with reproducible results. 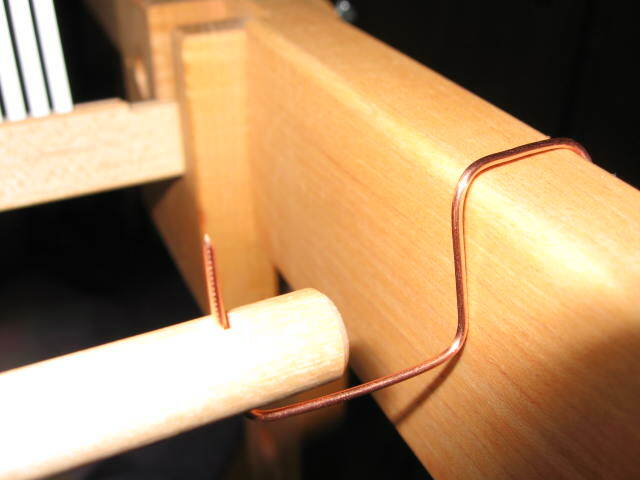 The only problem with my raddle is that I wanted to avoid using screws with eye-holes (suggested in Peggy Osterkamps’s book – so you can quickly run a dowel through them), so found some cable tacks to use instead. Unfortunately, they are very thick – a little less than an eigth of an inch, and I’m worried it may throw off cloth measurements by almost a quarter inch, counting both sides; this may be more of a problem when warping with very fine threads. Two of my books say the raddle is optional, and another two say it is a necessity. I didn’t make the connection between the raddle being used for warping back to front, but I definitely knew I didn’t want to use Deborah Chandler’s hybrid method of sleying the reed to use as a raddle, then re-sleying it after threading the heddles. 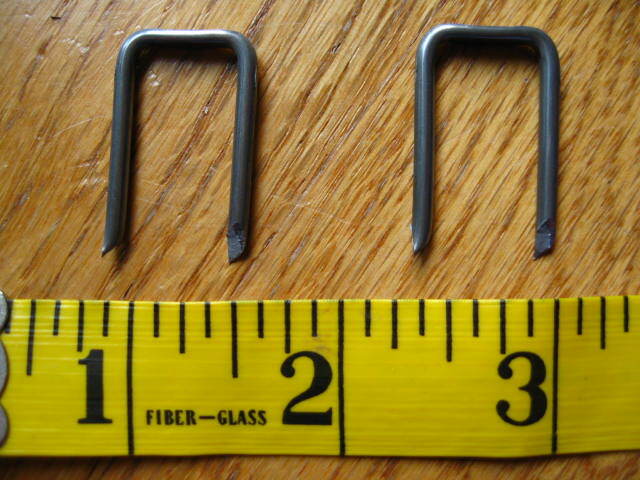 I plan to make a raddle for my 45″ Bergman loom, but I’ll use finishing nails instead of cable tacks. Being able to insert a dowel through the cable tacks wasn’t as handy as I thought it would be, and rubber bands work very well to keep the warp in place (although the cable tacks are long enough not to need the bands). 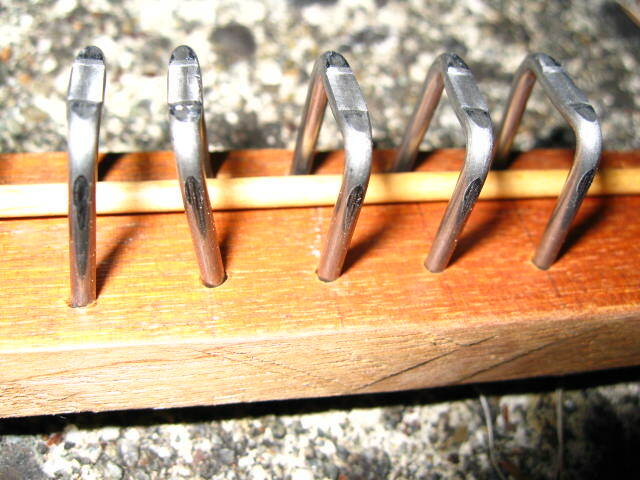 And a raddle with nails stored safely away couldn’t be worse than having spiked wool combs (truly lethal, yikes!) in the house. The Ravelry community is awesome. I would love to frequent the knitting forums more, if only I had more time. As a newbie to spinning (still under a year!) 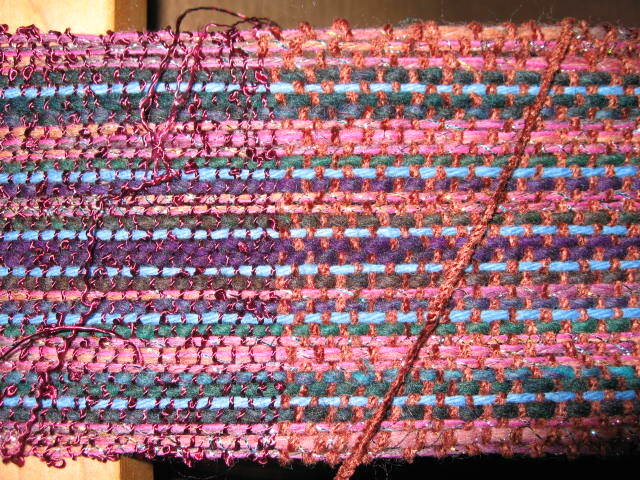 and even more so to weaving, it’s been a wonderful source of help and inspiration. Finally! My first weaving FO. The project that came with Hedy is finished. 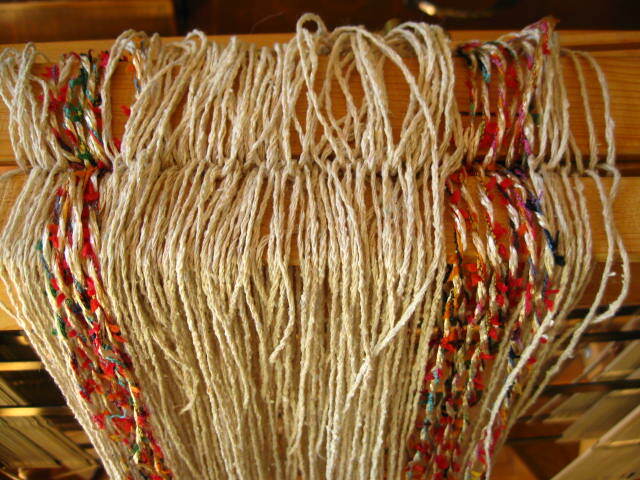 It would have been finished sooner if not for the time it took me to find appropriate yarn to make the warp repair. The colour doesn’t match, but the weight does. It’s surprisingly inconspicuous in the final product. I’m happy to report that the wispy bouclé thread that came with this project is finally used up. The closest match I could find was a chenille yarn. It’s heftier than the original, and much closer to the same weight as the warp. What a difference the yarn makes! Almost all the problems I had with evenness and selvedges disappeared! 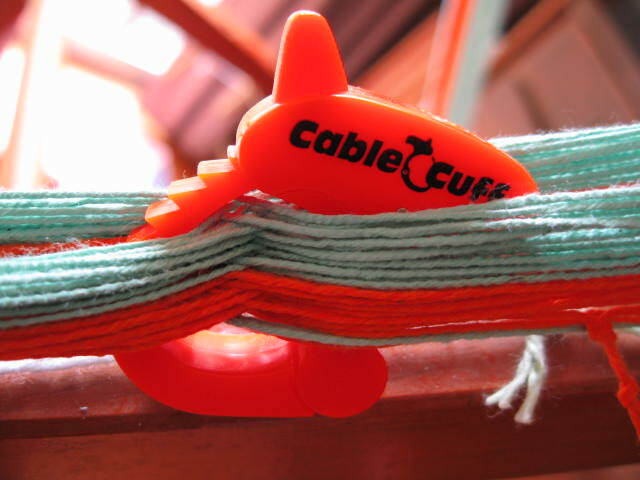 (BTW: Thank you, Jane, for great tips about grabbing the beater by the middle, and tying smaller bouts. They worked wonders for me!) The bouclé had been such a struggle to work with; I’m so relieved to find out it wasn’t me. Weaving goes along so much faster than knitting! I had woven more than a foot with the chenille yarn before it dawned on me to try out some weft floats that didn’t show up when using the bouclé. Of course, by that time, there were only a few inches left to weave. 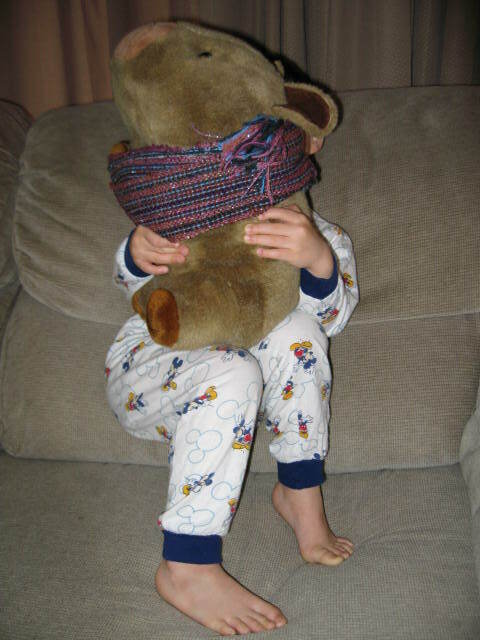 to dress Squiggly Pig’s owees. I was anxious to finish that sash and create my own project. I started out warping on the warping board that came with Hedy. Introducing the Humungo-Warper Frankenreel 2000. This warping reel is so large and heavy that it can knock out a boxer. But, I can (just barely) carry in, assemble, and take apart all the parts without any help. Which is a good thing, because within minutes of seeing me lug this into the house, my menfolk hastily vacated the premises. Muttering something about shopping. Lovely. Leaving me to figure out how to Warp. In. Peace. I measured several times, and found the circumference of one turn to be 110.75 inches, or 3.076 yards, or 281cm. I suppose they were aiming for three yards when they created this monster, and the extra 2.75 inches may be a result of humidity. (It looks very similar to Schacht’s horizontal warping mill, but that one is only two yards in circumference. If the Schacht can warp eighteen yards, I wonder how much mine can do.) With the cross bar skewing the weight of the sides, sometimes the reel swung around with such speed it was difficult not to wince — or duck — when the arms were swinging towards me. The cross bar can be moved to any location convenient to make up the warp length. In a sense, I don’t have to worry about a brake, because the sides tilt, even when base locking pegs are well seated. So the reel often hits one or the other side on the base; this slows it down, but doesn’t stop it. It’s a bother, but I’m learning to live with it by controlling how I swing the reel. I thought I was missing a second cross bar, but after setting this up, I don’t think so. A second cross bar wouldn’t eliminate the tilting, since that problem is caused by the base wobbling. 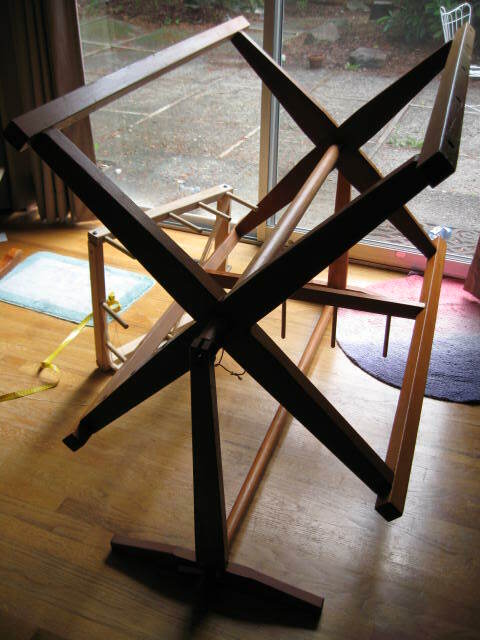 I may still ask a carpenter to make me a second one, because it would be very helpful for shorter warps. In this case, my shorter warp measured 212 inches, comprising 81 ends. For three dish towels. I also had the same problem Trapunto mentions, of uneven tension and lengths of warping threads created when the later threads deviate from the guide thread when wrapping around pegs, changing directions, and adding more thickness to the warp. 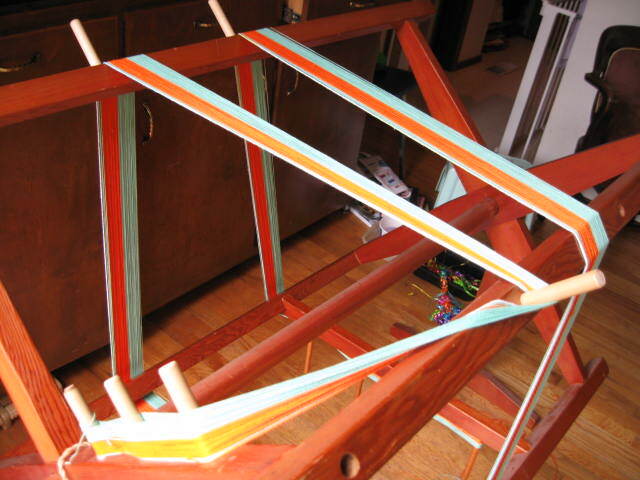 Because my design would be symmetrical, I decide to use the information from Tom Knisely’s video, “A Comprehensive Guide to Warping Your Loom from Front to Back”, and make my threads twice as long, doubling the ends when I warped the loom. 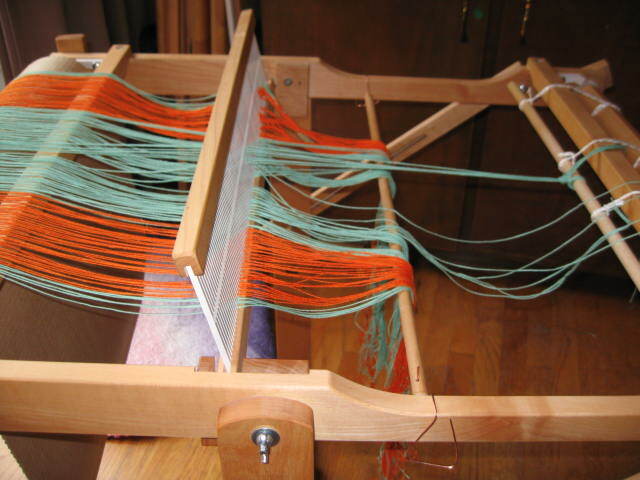 I didn’t want to tape an apron rod or stick to my loom frame (as Betty Davenport recommends), but thought a suspended apron rod would be very useful when threading the heddles. Above: Note the wire clips suspending the apron rod in place. 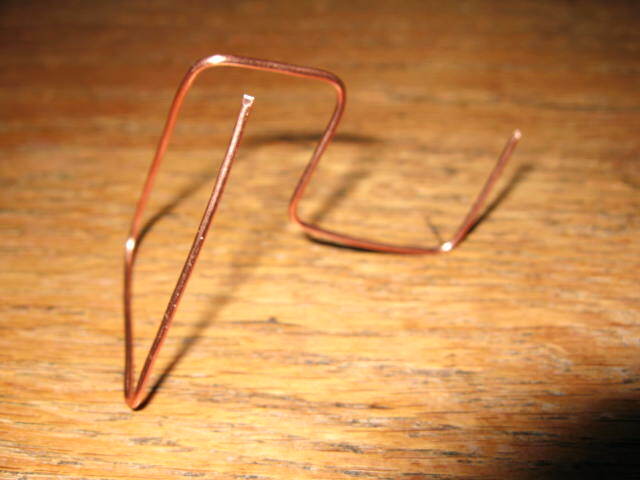 So I made these with the help of some wire-bending tools and copper wire. Two of my apron rods already had holes drilled. Warping the loom took forever! I had so much trouble with crossed and tangled ends, even though my crosses tied at both ends kept beautifully. 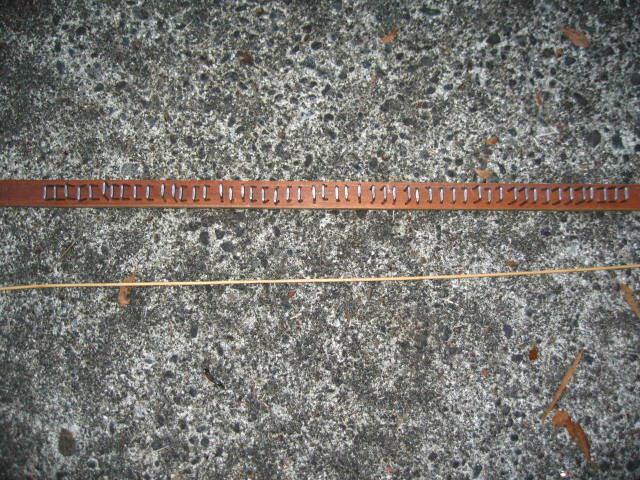 Then the problem of uneven lengths created while using the warping reel. I spent a lot of time combing through the ends to undo tangles and adjust tension. I’m sure that doubling the ends and cutting them in half exacerbated that issue, which created trouble at times when I had a few ends that were a bit too short for tying a bow on the front apron rods. Even counting out a little time for meals, bathing and putting my son to bed, I spent a solid fourteen hours warping the loom. (I turned down every Fourth of July invitation to have time to do this!) At this rate, I won’t be hawking my wares at the Pike Place Market any time soon. 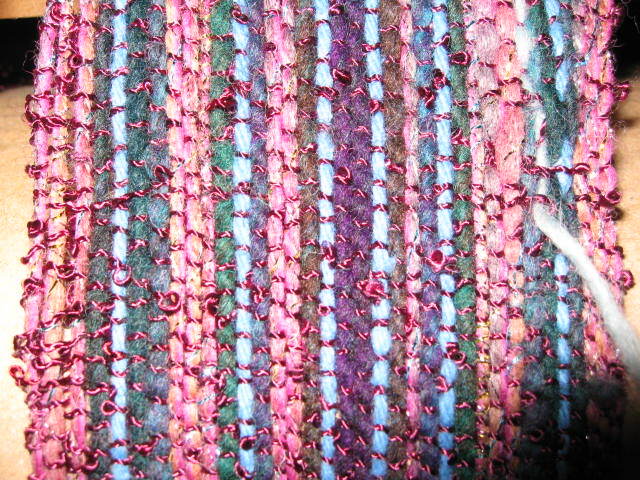 After the loom was finally warped (about 1AM), how could I sleep without doing some weaving??? This first towel was woven in less than two hours, even including unravelling and re-weaving something like thirty percent of it to get it right. Approximately 14.5″ x 22″. 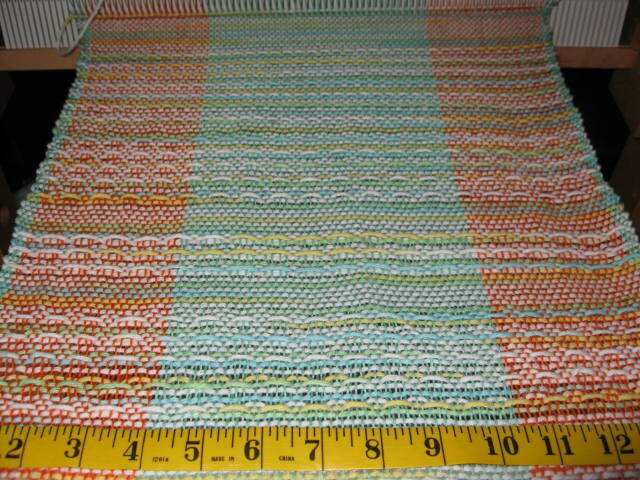 Warp at 34 wpi, weft at 18 wpi, 100% cotton. Using a 10-dent (my only) heddle. 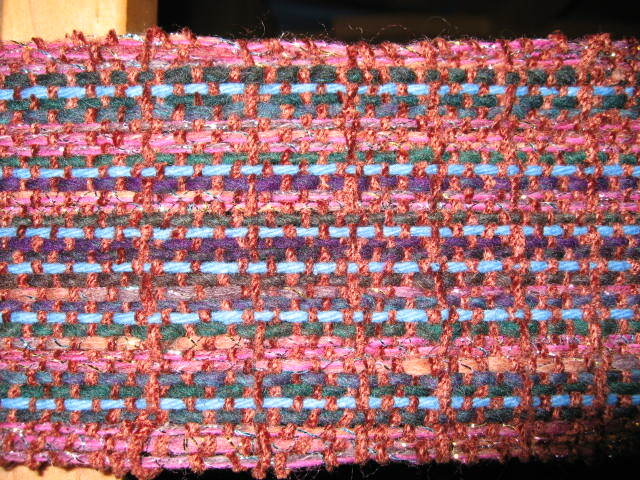 The weave is less dense than I’d like; I completely forgot about making an arc with the weft before beating to obscure more of the warp, so I’ll have to try that next time. I’ll be weaving more towels like this, as an exercise in creating some of the patterns from Betty Davenport’s rigid heddle pattern book. In case you are wondering: “Where did she get her fabulous sense of colour from?” Well, My Dear, thank you very much for asking. It’s taken years of dedicated study, but I have a degree in “Because I can’t afford to pay retail, I get what I can scrounge together from whatever bargain-priced lots I bought”. I’d love to hear of them!